I keep meaning to write about a visitor we had to our garden a few weeks ago. Mr. Bsag was around during the day, and said that he heard an unusual sound in the garden, like a very loud squeal. 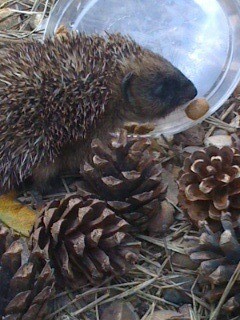 When he went out, he found this tiny hedgehog, calling loudly1. He also came across the dead body of another hedgehog of a similar size elsewhere in the garden, so we think that something (possibly a cat or a fox) may have attacked a family. He called me for advice (not that I’m any kind of hedgehog expert), and I suggested soaking some of the cats’ dry food to rehydrate it and then offering it that. He did that, and while he was waiting for the food to soak, built a shelter of sorts out of a bit of old drainpipe and some branches to give the poor thing somewhere to escape from predators. He had to leave to travel into town, but when I got home in the evening, I went out to see if it was still there. Sure enough, there it was, trundling around like a miniature tank. All hedgehogs have a rather peculiar gait, but this little one was motoring around the garden like a Roman army, bulldozing straight through or tumbling over any obstacles in its way. When you are the size of two pinecones, there are a lot of obstacles in a garden. I gave it a bit more food and also put out a dish of water, which it lapped up very avidly, its tiny pink tongue dipping in and out of the water. It was very active and didn’t seem to be injured or ill, but I was worried about it being out during the day. At the same time, I didn’t want to remove it from the garden in case its remaining siblings or the mother was around somewhere and would come back to get it. I continued to see and hear it until it got dark, and then it disappeared, and I haven’t seen any sign of it since. We haven’t found a body either, so I really hope that it managed to find somewhere safe to spend the days, and is still happily trucking around the neighbourhood. We have plenty of slugs and snails, on which it is very welcome to feast any time it likes.